I thought it would be a good idea to show you my fake tan routine. In summer I like to have a nice tan, but most of the time I’m stuck inside due to work :-( that’s why I like to use fake tan products. 2. It’s better to build up a fake tan over ceveral days , then to use a really really really dark fake tan thinking you will be a Bronze Godess overnight … been there , don that and guess what … it doesn’t work peeps ! 1/ make sure you scrub your body before applying fake tan. 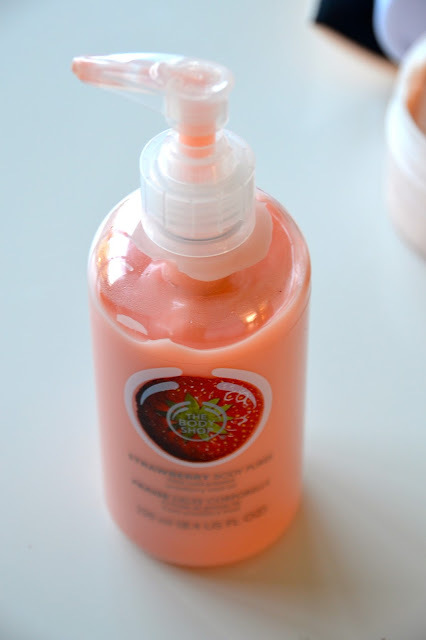 I like to use The Bodyshop –Vineyard Peach Body Scrub . 2/ apply a body lotion which isn’t too greasy. I find it helps a bit to avoid dry areas. Remember: dry areas absorb more of the fake tan product which causes stains … and ladies: that’s not how you want to end up looking ! ;-) I like to use ‘Strawberry Body Puree’ . 3/ Apply a fake tan product with color: it gives you an instant tan effect and helps you see which areas you’ve already put the product on. 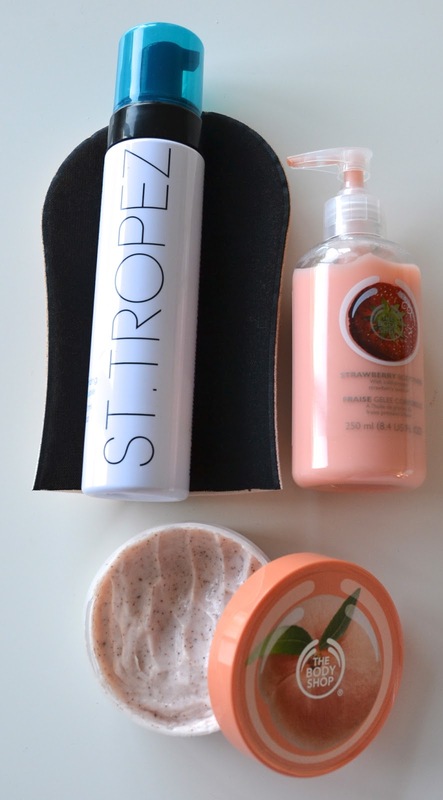 I like to use the ST.Tropez Bronzing Mousse, out of all the products I used/ tested, this 1 is my absolute favorite ! Ok it smells, but hardly as bad as those other fake tan products out there. I bought a special St.Tropez fake tan glove which helps you to divide the product better & prevents your hands from absorbing too much product. I even use this product for my face ! 4/ after letting it dry, I use a scented body spray to cover up any Fake Tan smells. I like to use these from Victoria Secret which I blogged about in a previous blogpost.